PRACTICE BROADCASTS: Live on www.Indycar.com with analysis from the Advance Auto Parts INDYCAR Radio Network (AAPIRN) and on the INDYCAR YouTube channel on Friday beginning at 11 a.m. and 2:35 p.m. ET and Saturday beginning at 10 a.m. Also on the INDYCAR 18 app. QUALIFYING BROADCAST: NBCSN will air live coverage on Saturday, July 28 at 1:30 p.m. ET, on the (AAPIRN), the INDYCAR 18 app and www.indycar.com (timing & scoring + live analysis). The 2018 Honda Indy 200 will mark the 21st Indy car event for Rahal Letterman Lanigan Racing (RLL) at Mid-Ohio Sports Car course, near the team’s Hilliard, Ohio base. The team also competed in the Atlantic Series race in 2003 with Danica Patrick and has competed in ALMS races here in 2007 and from 2009-2012. 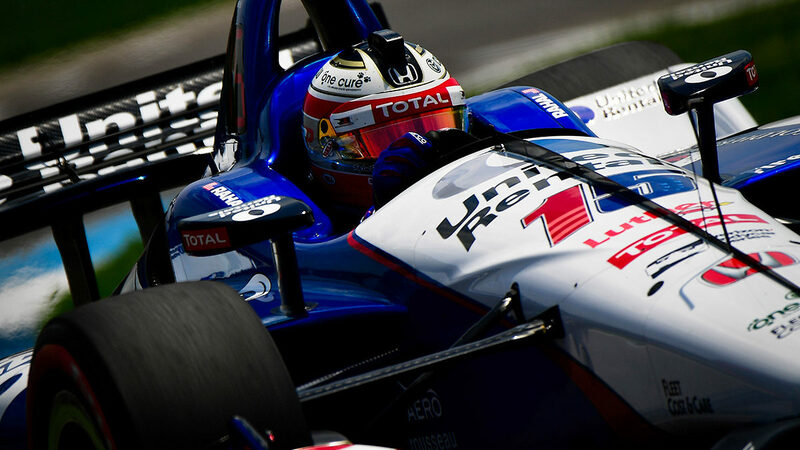 The team has one win (G. Rahal 2015), three podiums (3rd: B. Rahal 1997, 1998) and the highest start is pole (Herta 1997). Another front row start came in 1999 (Herta; 2nd). 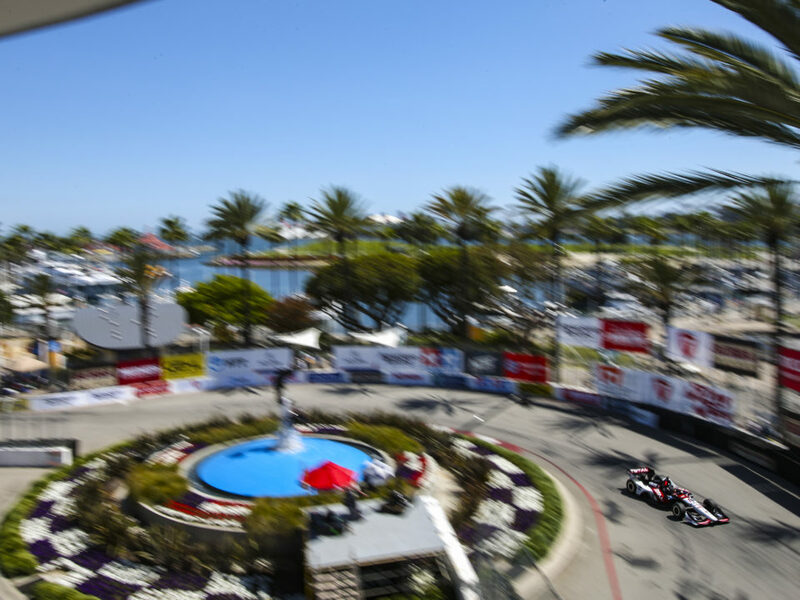 Prior to the 2018 event, the team prepared a total of 30 Indy car entries for drivers Bobby Rahal (1992-98), Mike Groff (1994), Raul Boesel (1995), Bryan Herta (1996-99), Max Papis (1999-2001), Jimmy Vasser (2002), Michel Jourdain Jr. (2002-03) Ryan Hunter-Reay (2007-2008), Takuma Sato (2012), James Jakes (2013) and Graham Rahal (2013-2017). 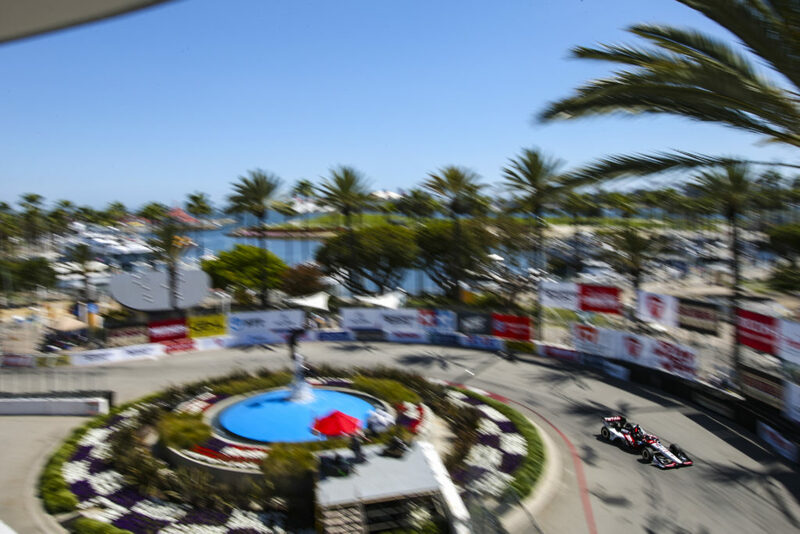 The team has earned FOUR podiums (1st – G. Rahal 2015; 3rd – B. Rahal 1997, 1998, G. Rahal 2017), 13 top-five’s and 17 top-10 finishes at the track. The No. 15 Fifth Third Bank entry for Graham Rahal and No. 30 Mi-Jack / Panasonic entry for Takuma Sato will bring the Indy car total to 32 entries in 2018. After matching his best Mid-Ohio qualifying performance of fourth in 2017, Graham set the fastest time in the race morning warm-up. He had set the fastest overall time in qualifying in Round 2 although Round 3 times are considered the official ones. From the start of the race, Rahal pressured third place Sato and utilized a lot of Push to Pass and his tires to finally get by on Lap 14. Once by, he focused on catching back up to second place Power (-0.8) and leader Newgarden (-4.6). As the pit cycle started, he stayed out one lap longer than the top-two and cycled into the lead before he made his stop on Lap 18. He came back on track ahead of second place Power but was unable to hold him off due to being on cold tires to Power’s hot ones. He cycled into the lead again before his second stop on Lap 42 but got back on track with the lapped car of Munoz between himself and second place Power. Munoz was difficult to pass as he was using P2P on each straight to keep Rahal behind. By Lap 57, he was able to pass him but had lost a lot of track position to second place Power (-5.9) and leader Newgarden (-13.3). He had just made his third stop on Lap 66 when Jones brought out a full course caution. When the race restarted, 18th place Gutierrez was second in running order ahead of Power and Rahal which enabled Newgarden to pull away again. Both Power and Rahal were on the quicker alternate tires to Newgarden’s primary ones but were unable to take advantage of that. 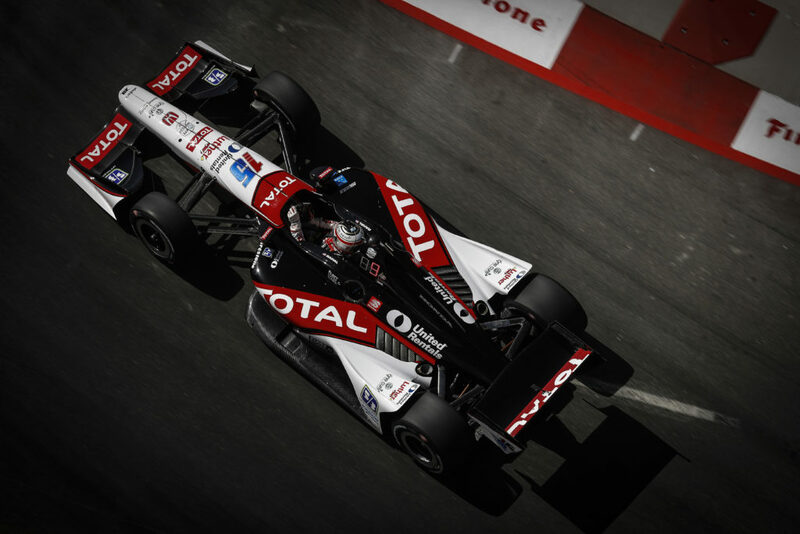 On Lap 73/90, Rahal was alongside Power to challenge for second place but had to back off or both would be taken out. He ultimately finished third to earn his fourth consecutive top-five finish at this track. He is hoping to continue the competitive runs at his home track. This will be Takuma’s 9th race here. In his eight previous races, his best start is third – in 2010 with KVRT and in 2017 with Andretti Autosport. He has two top-five finishes and three top-10’s. In 2011 he finished fourth with KVRT and he finished fifth last year after starting third. After a fourth place finish at Road America and third place in Iowa this season, he looked likely to finish well in Toronto after setting the fourth, second and fastest times in the pre-qualifying practices but rain during qualifying shuffled the order and he qualified seventh. He ran as high as third in the race but was forced to retire after he brushed the wall coming out of the final turn on Lap 66/80. He hopes to pick up where he left off at Mid-Ohio last year and continue to build momentum this season. The 2018 Honda Indy 200 will mark Rahal’s 11th Indy car race here. His best start is fourth in 2009 and 2017 and his best finish is his win here in 2015. He has competed in many other series at his “home track.” Details for 2017 are above. In 2016, he started sixth and was passed by Montoya on the start when he experienced an over boost. Once that was adjusted, he settled into seventh place and made his first stop on Lap 17 during a caution for contact between Dixon and Castroneves. He returned to the race in 17th place while multiple fuel strategies were in play and the top three had yet to pit. He moved up to eighth when he made his second stop on Lap 40/90 and returned to the track in 14th place. After attrition took a few drivers out, Rahal ran 10th by Lap 51. He passed Pigot for ninth place on Lap 59 and made his final stop during the caution for Hawksworth on Lap 62. He returned to the track in 10th place and once the race was restarted, fifth place Kimball drove off track and Rahal moved into 9th. He was able to pass Kanaan on Lap 67 for eighth place and Ryan Hunter-Reay for seventh on Lap 77. Once race leader Daly made his out-of-sequence stop on Lap 84, Rahal moved into sixth. 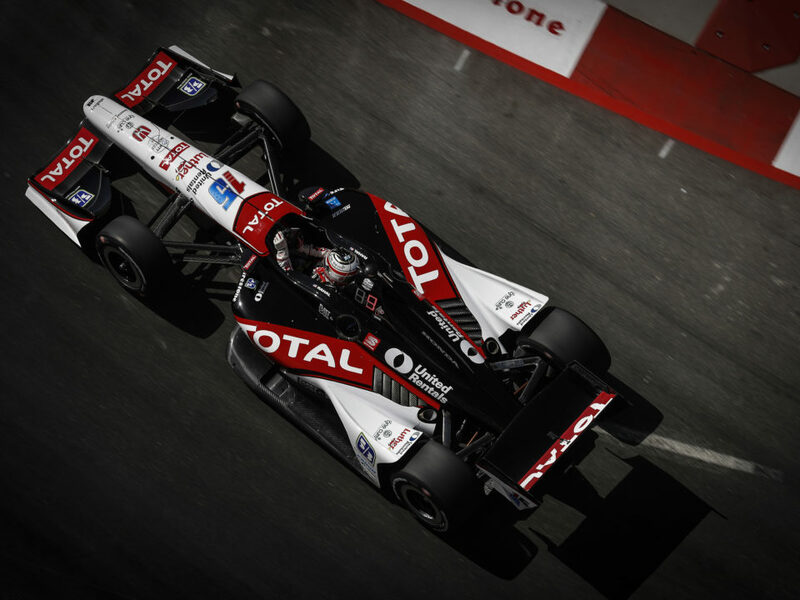 He closed on Bourdais to set up a possible pass but fifth place Bourdais attempted to pass fourth place Sato and the two collided and Rahal moved to fourth. He closed on third place Munoz but was unable to pass before the checkered flag. In 2015, he led a race-high 23 laps en route to victory with a 3.4-second margin over Justin Wilson after he started 13th. In 2014, he qualified seventh and avoided an opening lap, multi-car crash to take over fourth place. He maintained a top-five position throughout the race with the exception of pit cycles and ran as high as third at one point. An alternate strategy played out for eventual winner Dixon who started 22nd and made four pit stops in comparison to the majority who made three. 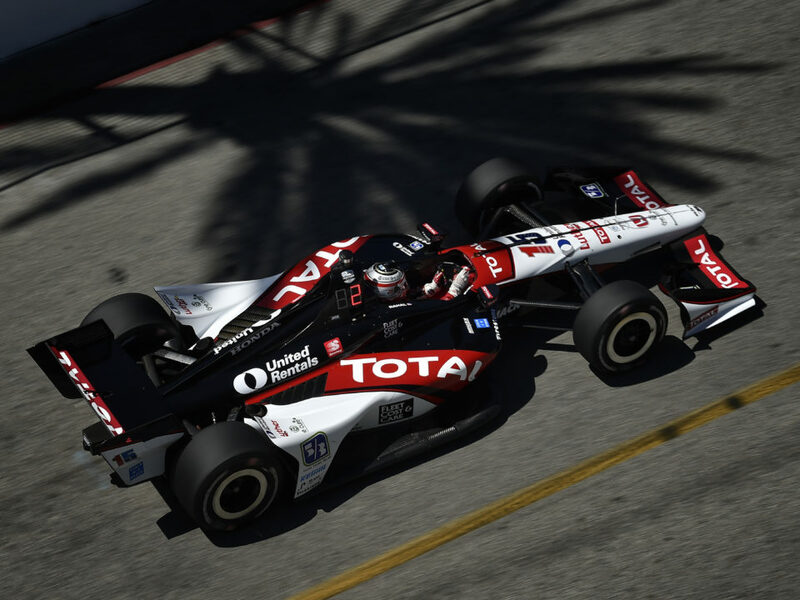 Rahal took the checkered flag in fifth place, his best finish at the time. 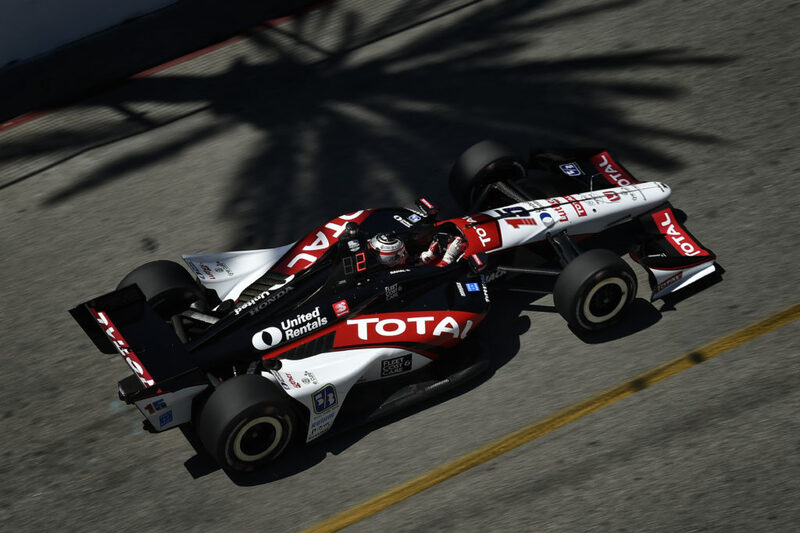 In 2013, Rahal qualified 22nd, and ran as high as eighth on a three pit stop strategy but finished 18th after being held up by drivers on a two-stop strategy. In 2012 he qualified 22nd, started 21st (engine penalty ahead on grid) and finished 11th with Service Central Chip Ganassi Racing (SCCGR). In 2011 he qualified sixth, stalled in the pits after his first stop and finished 24th with SCCGR. In 2010, he qualified 25th with Newman/Haas/Lanigan Racing (NHLR) and had moved up to 14th when he attempted to pass Wheldon for 13th on Lap 61/85 in T2 and went off course and dropped to 21st before he gained one spot to finish 20th. In 2009, he started fourth with NHLR and looked likely to finish fourth before an off-track excursion while fifth late in the race led to an eighth place finish. In 2008, he started 14th with NHLR and ran as high as eighth, but an off track excursion on lap 53 limited him to a 16th place finish. At the age of 16 in 2005, he became the youngest to claim the SCCA National Formula Atlantic championship at the SCCA National Championship Runoffs here by a dominant 43-seconds. He also competed in the Star Mazda race here in 2005 (S/F 4/9) and tested a Grand Am car here in 2007. After recent competitive outings at Road America, Iowa and Toronto after turning the corner in with a fifth place finish at Round 7 in Detroit, Sato is looking forward to the final five races of the season. Road course events at Mid-Ohio, Portland and the double-points finale at Sonoma should be strong events for Takuma but Pocono, where he won pole in 2017, and St. Louis, should also prove competitive. Danica Patrick, who competed for the team in the Barber Dodge Pro Series, Toyota Atlantic Series and IndyCar Series from 2002-2006, will be honored at the 7th Annual Safelite AutoGlass “Rally for The Ranch,” a three-event extravaganza to be held July 26 and July 28-29. The event is supported by The Bobby Rahal Foundation and benefits The Buckeye Ranch and its programs that help area youths and their families dealing with mental, behavioral and substance abuse issues. Previous honorees include Johnny Rutherford (2012), Al Unser, Jr. (2013), Rick Mears (2014), Bobby Unser (2015), Dario Franchitti (2016), and Tony Kanaan (2017).